Nagendran, T., Poole, V., Harris, J., Taylor, A. M. Use of Pre-Assembled Plastic Microfluidic Chips for Compartmentalizing Primary Murine Neurons. J. Vis. Exp. (141), e58421, doi:10.3791/58421 (2018). 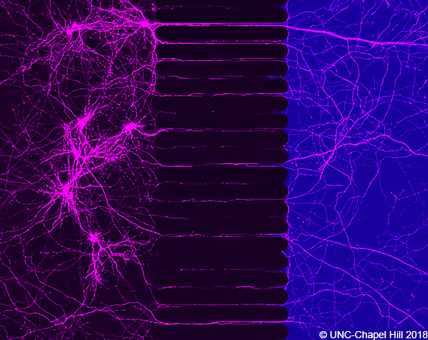 Primary hippocampal neurons grown in the XonaChip™. The XonaChip™ offers a high quality, reproducible method for the compartmentalization, fluidic isolation and improved organization of neuronal cultures. XONA MICROFLUIDICS offers a wide selection of devices for neuron cell culture. Try our new XonaChips™–they are pre-assembled and easy to use! They are especially great for culturing human stem cell-derived neurons. The XonaChip™ offers the researcher a novel method to isolate and grow axons, ultimately delivering the ability to study neuronal response to axonal damage due to disease or injury in an isolated fluidic environment. International Customers please contact Xona through the website or email Xona using info “at” xona.us if you would like to arrange a time to speak by phone.